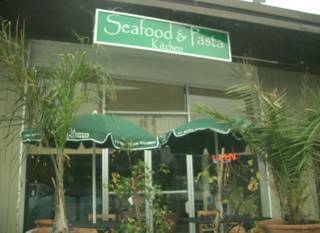 Fans of the now defunct Pronto Pasta hidden on an ugly little Trading Estate on the South Side of San Rafael close to the 101 may be interested to learn that it has reopened as The Seafood and Pasta Kitchen, under new ownership. It's not far from our workplace and one of the reasons we always liked to eat there was because it was nearby, convenient and generally good enough for a quick satisfying lunch. On some occasions in the past, Christine and Franco's cooking had been so perfect I'd almost been reduced to tears of joy. Other times it had been so far off the mark I would have vowed never to return again had it not been for the almost orgasmic experiences I knew they were capable of delivering. As soon as it reopened, a couple of weeks ago, we were the very first customers to order lunch. We've returned a few times since then which makes now a good time to share our first impressions of the upgraded menu and the new chef. Fred had three favourite Pronto Pasta pasta dishes, all of which still remain as part of the menu. They are so similar, that it would be hard to imagine that the recipes for these dishes were not passed on. 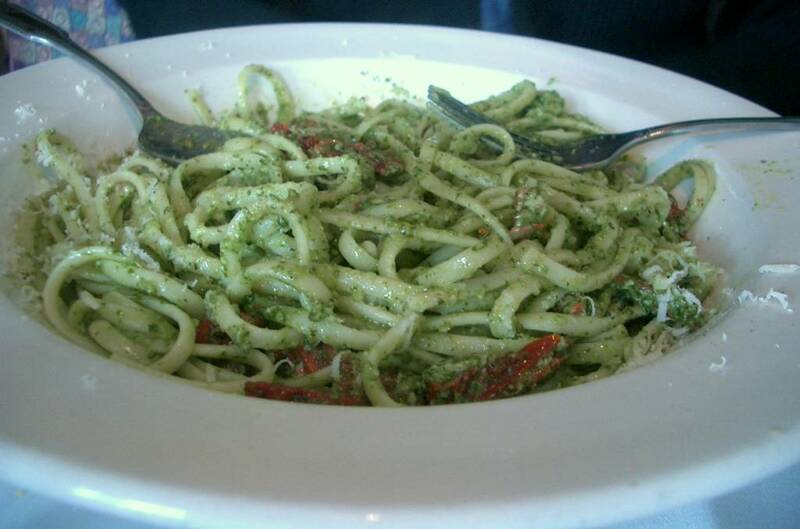 Linguine Pesto Homemade pesto and sundried tomatoes on top of linguine pasta 9.50 This dish hasn't changed much from Pronto's version. 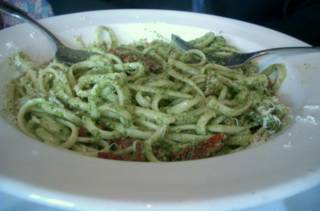 The serving is generous with a large amount of pesto. The extra flourish of sun dried tomatoes is one of the new owner's additions which adds a little variety and extra texture. Fred declared the dish as good as he remembered it. 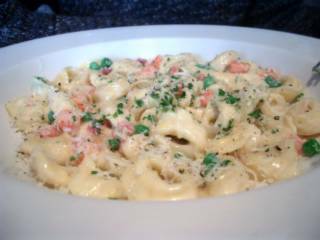 Tortellini with Cream Sauce Cheese tortellini in a cheesy cream sauce with tomato concasse, peas and prosciutto 8.95 This has always been one of my favourites. 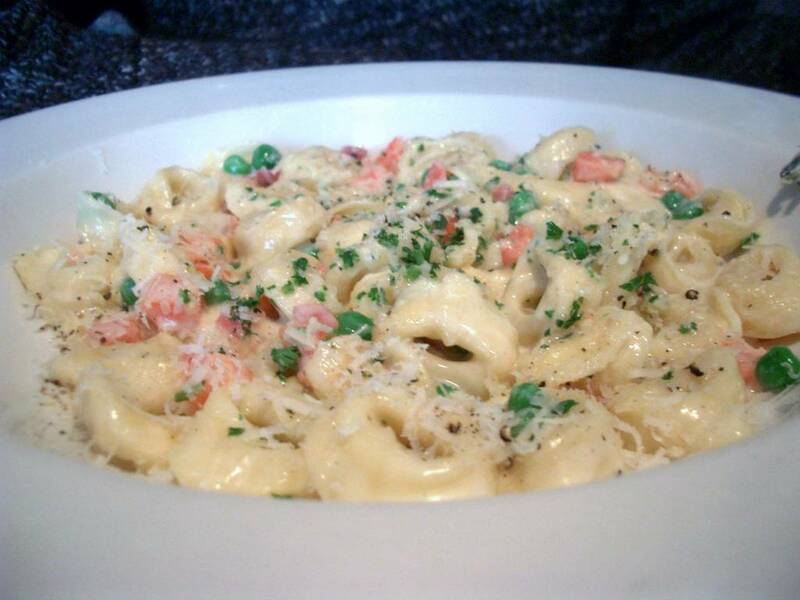 I don't normally order it myself because the combination of wicked, rich, and creamy sauce with the dense pasta would send me to sleep for the whole afternoon. Fred always kindly lets me try one or two from his plate. The new version, again, is similar to the previous one, but even richer still. The addition of tomato concasse does a little, but not much, to bite through all of that dairy. Spaghetti Pomodoro Fresh tomatoes, garlic, basil and kitchen made marinara sauce 7.25 (no picture). Fred declared this dish to be good, still, but not quite as good as he remembered from before. Fettuccine al Camarones 4 large prawns with basil, prosciutto in a Roasted Garlic Cream Sauce 10.75 The 4 large prawns actually turned out to be 6 medium sized ones which had a slight yellow tinge instead of the bright white I would have preferred to see. They didn't taste bad or off, however, so I suspect they may have been slightly discoloured by the sauce. 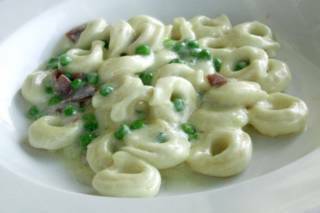 Because of the cream, this is another fairly rich dish, but the basil and prosciutto impart some interesting savoury flavours. 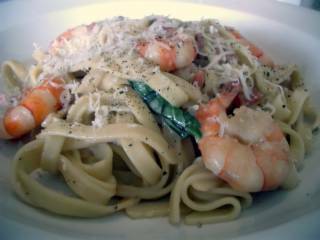 Forgive me for the social faux pas of adding parmesan to an Italianesque seafood dish, but I was experimenting with umami. I would be in no great hurry to order this again, but it is ok. Baked Sandwich served with salad and fruit of the day. Sirloin Steak, grilled onions, tomatoes and melted provolone cheese 6.95 (no picture) This is a huge lunch dish. Way to much for little ole me. When it arrived, it looked pretty good, particularly as the meat was juicy and pink and the cheese appeared to have just the right amount of meltiness. A generous and well dressed salad of mixed green leaves with a few halves of miniature tomaaahtoes plus some slices of melon filled any remaining space on the plate. The bread - a floury Italian white, quite thick and dense formed the base of the sandwich. Baked, yes, but not baked enough. A more hearty does of toasting would have improved it no end. Better still, I wish they would use their far more delicious focaccia bread to build the sandwich. I am sure they might if I asked. I opened up my bread slices and proceeded to eat mainly the filling with only a small amount of the bread. The meat was indeed delicious, far better quality than you would expect in a cheapish sandwich, and cooked to perfection. The flavour, no doubt. had something to do with the enormous amount of fat on the meat which I naturally removed and left on the edge of the plate. Cheese and onions were good too. Salad was a little brown in a few places but nicely dressed. As we left the restaurant that day, the chef came running after me. "I am really sorry, next time I will remember to cut off the fat". I assured him it was ok because I was sure it was the fat that gave it such good flavour. He replied, then, that he would cook with the fat, then trim before serving. It was sweet of him to notice from looking at my returned plate, and to offer, personally, to try improve the dish the next time. Gorgeous presentation. 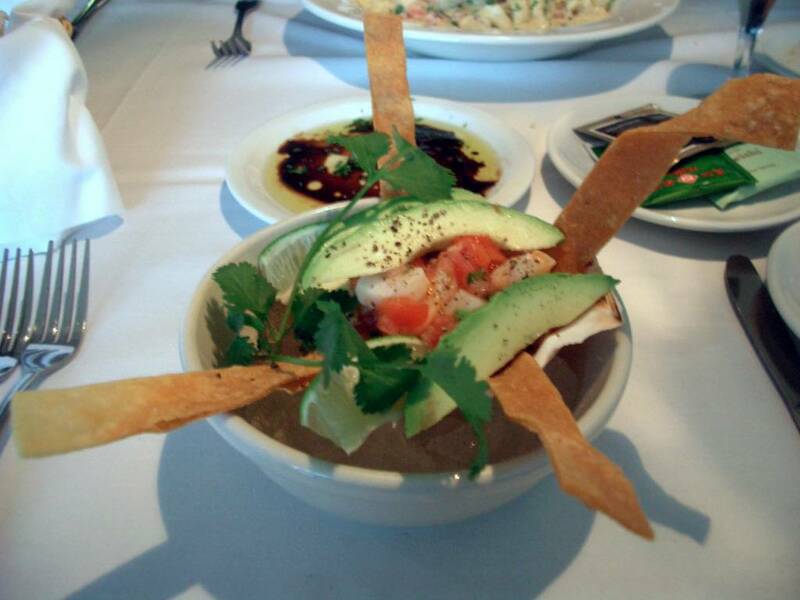 Resting on a bed of ice, a pretty scallop shell filled with the ceviche , topped with the perfectly ripe and creamy avocado and sporting four long, jaunty flourishes of crispy tortilla. The suburbs of San Rafael, really aren't ready for this fancy look, especially at lunch time. Despite the waiter telling me the ceviche fish would be halibut and salmon, it actually was just scallops. But the type of seafood used would have made no difference to the disappointment I felt when I tasted it. The treatment of the delicate little molluscs was quite unwieldy. The poor little things had been drowned in an acid bath of sour citrus and untasty winter tomaahtoes. Will I try it again another time? Not on your nelly! Steamers Clams cooked in white wine, roasted garlic and a touch of cream, served with toasted baguettes 11.75 (no picture) I was very excited about this dish. Clams make for a light, tasty, not-too-carby lunch and I was hoping it would be something I could order often. Too much to hope for? Of course. Ugh! Chewy, overly briny tasting clams, not cooked evenly, not fresh tasting at all. I wanted to send the new Chef back to the drawing board with that one. Nothing wrong with the sauce or the toast, but you've got to get the star ingredients right if you want to keep in business, especially if Seafood is your first name. Conclusion. From our four lunchtime visits so far I would surmise that the chef is too ambitious with the menu. It offers too much. There are eleven appetizers, nine of which are seafood. There are four different salads, of which the Frisee is next on my list to try (with shallot mustard vinaigrette, prosciutto and poached egg). There are six side-dishes offered, none of which we've tried yet, all priced at 2.95 each. There are 8 entrees, two meat, the rest fish, plus eleven pastas, not to mention the separate lunchtime sandwich menu. It's like the old pronto menu with a whole extra menu of seafood thrown on top. When Franco used to do seafood, it was often a special that he'd found at the market just that day. With the new menu, and the small, but growing, number of clientele, there is no way that all the ingredients on offer can be fresh, and it shows in the results. ANON -2 NOT "YEARS" - THEY HAVE ONLY BEEN OPEN a year, and franco before them definitely used fresh ingredients. I did ask them about their fish sources, they know nothing about sustainable fishing. It all comes off a truck from sacramento. since we moved away from San Rafael I havent missed this place for a second. i ran into franco at ranch 99 during the summer and he said that they were the food concession at petaluma's outlet mall. When I visited California a few years ago I stopped by and had a wonderful experience their. The seafood was tasty and filling.